After printing out the next version of Codename: Vacuum last week, I got it to the table on Thursday lunchtime. The new version had some minor tweaks to reduce the Population strategy's dependence on capturing locations, and some changes to the Trade strategy to the same end. To reflect the new trade rules I also changed several of the advanced decks to make them fit better with the new Trade rules. The new version was well-received by my playtesters, Chief and Dave though due to the selection of advanced decks available to us none of us chose to pursue the Trade strategy - so it's hard to say how well balanced that one is. Despite getting no feedback here last week on the new level three art, Dave was appreciative (though Dave is very excitable, so his responses need to be calibrated to take his general excitement into consideration). Certainly I prefer it to the really crappy last version, and the new art didn't detract from the game or make it harder to comprehend. Anyway, to the subject of this post. I've now played 60 games of Codename: Vacuum. It's predominantly been played with Chief and Dave (probably 40-odd games each), plus a bunch of other people have played it I'd imagine on average five times or less. Pretty much all the players have been close friends of mine, so any feedback I get from them is coloured by their friendship with me. If I had to grade them into three categories, I'd say that two of them really aren't fans (though apparently it's not their sort of game), one (the aforementioned excitable Dave) is a big fan, and everyone else is ambivalent. They've usually played it a few times but there's little interest in playing it again. Clearly it still needs lots of work (though in fairness, most of the ambivalents haven't played the last few versions). I'm keen not to try to publish (either self-publishing or trying to get someone else to do it for me) unless I think it's genuinely great. I've some experience publishing games that didn't get enough people excited and the last thing I want is to be the proud owner of games mouldering in a warehouse for years again. I could make a hand-made run - I'm pretty sure I could sell one hundred copies of the game as it stands - but I want to be really proud of it, not just publish it for the sake of publishing it (I've done that already!) and spare time is precious now that I'm a father. So I need to keep working at it to change those percentages. It needs to be simpler and quicker and more fun. It needs to leave you wanting another game, and then another. It's not there yet. I need to work those percentages until most of the people who play it are big fans or hate it. Ambivalence is the worse of the three! In other news, I've decided to make a little app for my Windows phone. It'll pick me a random selection of advanced decks for a game and I'm also thinking of making it store and explore the data I collect for a game so I can investigate how balanced the decks are by querying their popularity and how well they score. I'll need to get a few dev kit things together and then spend some time on it. It shouldn't be that hard though, it's programming in the language that I use for my day job! I've not made much progress on anything the last couple of weeks. The week before last ended with us all coming down with norovirus, one after the other (which for the record was awful, I can't recommend it!). This week, it's been a game of catch up as The Wife and I have tried to regain our strength while washing everything that we own, since The Daughter was sick on it all, followed by a weekend away with old friends. Rather than putting the limited time I had to good use and re-writing the rules (which I still haven't done! 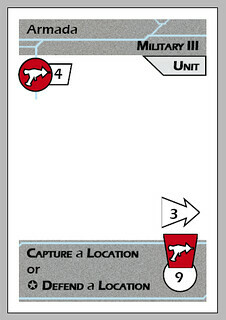 ), I've been fannying on doing unimportant stuff like art (which doesn't really matter for a prototype) and getting another version ready for printing (of rules that I'm not sure will work). My tenuous excuse for putting off writing the rules is that I'm still trying out a few new rules ideas, so things are in flux, but if I'm honest, it's a big job and a hard one, and I can't be arsed at the moment. Monday was potentially a good night for Game Design, since The Wife was out at the theatre with a friend, but in the end once I'd finished cleaning up I was so knackered I just went to bed. What little time I've had available I've put into doing a couple of things, re-doing the artwork for the level three (futuristic) cards, and getting another version ready for printing out and assembling. As I've mentioned over the last couple of weeks I've been messing with the trade strategy rules in an attempt to decouple them from needing to own lots of locations. Since I ought to be knocking up a new version this month anyway, I've taken the opportunity to take the new Trade rules I'm trying out and re-jigged all the advanced cards so that they fit with these experimental rules. I've also folded in the new artwork. All I need to do now is get the new version printed, cut out and tested to see how it all works. Since moving back to Newcastle in the north-east of England a couple of years ago, I've played a lot of games. Which is obviously a Good Thing™. But I've tended to play a small subset of my medium sized collection. Since starting playtesting Codename: Vacuum in earnest last October I've played a lot of games of that too. Also a good thing. But almost all of them have been on a lunchtime at work with Chief and/or Dave. Don't get me wrong, both of those things are awesome, but for a designer to florish he needs to be exposed to lots of different games to get ideas, and for a prototype to florish it needs to be exposed to lots of playtesters to get a wider range of feedback and ideas. I've been toying with the idea of hosting a semi-regular playtesting night at my house, but to be honest it would be the same people coming who come to my weekly Games Night, and not all of them are up for playtesting, or enamoured of Codename: Vacuum. Newcastle has a great games club that meet twice a month on a Saturday afternoon / evening: Newcastle Gamers, but due to family commitments and visiting/visits by friends and family I've only managed to get there a handful of times in the last couple of years. I managed to make it along a couple of weeks ago where I met a couple of other board game designers: Dan and Michał. Dan was keen to set up some kind of playtesting session, and had been speaking to Rob Harris of Playtest London about possibly setting up a Newcastle franchise to complement their existing regular London and Cambridge meetups. Playtest London have been running for the last 3 years, more recently branching out into Cambridge as well. They've test hundreds of games, and playtest members themselves have had some notable successes: recently Matt Dunstan's game Relic Runners has been picked up by Days of Wonder, and Brett Gilbert's Divinare has been put on the recommended list for the prestigious Spiel Des Jahres German games award. Playtest are looking to branch out with several new groups starting this year. Over the last couple of weeks, Dan (with a tiny amount of help from yours truly) has created the Newcastle Playtest meetup, which will convene every first Tuesday of the month in The Bridge Hotel, Newcastle right by the train station from 7pm. If you live in the north-east of England (or fancy a day trip to sunny Newcastle) why not join us for our inaugural session on Tuesday 6th August? This week has been a game of two ends, like football (that's soccer for my largely American audience). In the first half, I've been chatting via email with the two designers I played a prototype with at last week's Newcastle Gamers about setting up a Newcastle playtest meetup once a month at a local pub. Dan seems to be very keen (and far more organised than me!) so this might actually happen, starting next month. I'm going to try to get both a new version of Codename: Vacuum and a version of my new Codename: Proteome idea together for the inaugural session. The Proteome idea is a complete reboot, significantly different from the prototype I made and played once in February last year, although bizarrely uses a very similar set of cards. The Vacuum idea would be a major change as I mentioned last week to separate out the Trade (and to a lesser degree Population) strategy from a dependence on owning locations and hence the Military strategy. Which leads me on nicely to the second half - Ding, ding! Change ends. The second half of the week has been all about the Trade strategy of Codename Vacuum. I've been through several ideas in my head some which add extra components, some which add extra complexity and some which simplify everything to the point of making the Trade strategy dull as ditchwater. The Trade strategy as it stands in my current prototype was designed to add another form of direct interaction between players on top of the Military struggle for controlling locations. As it stands it doesn't really succeed - you trade with the neutrals if you can, and the player with the least cash if you can't. There's not a lot of interesting decisions to be had there, or in fact, much in the way of player interaction. So I've spent my hours walking to and from work thinking of half a dozen new ideas to make Trade interesting again. The constraint being that if you get your arse handed to you in a Military beat down, you can still Trade effectively. I've gone through ideas featuring adding corporations to locations with little discs in the players' colours, taking corporation cards out and into play like locations, adding resource types to locations and a few others. I want try out a few of them, but ideally without coming up with significantly different art/cards until I'm happy with the idea. I played with Chief on Thursday lunchtime, trying one of them out. Ideally, I want something that: separates Trade from a dependency on locations, adds player interaction, simplifies the game mechanics, doesn't make the locations too similar, oh and I want the moon on a stick. Surely, that's not too much to ask? The first idea I tried on Thursday: letting players bring the corporations into play like locations, and then getting coins for them every turn with points for the number of corporations you had 'incorporated' at the end of the game. It didn't really seem to work at all, though Chief said he liked the idea. Back to the drawing board I think. Anyway, all these ideas have got me thinking about significantly changing Vacuum. A fresh injection of ideas can only help at this stage: at best I'll introduce some changes that significantly improve things, at worst I'll try out some ideas and ultimately reject them. Just last week I was bemoaning that I'd not had a chance to play Codename: Vacuum for a couple of weeks. Thankfully I made up for that this week, getting a couple of games in at lunch with Chief. The first one was the first play of a tweaked version of the June rules, tweaked to fix a problem with the Population strategy. It went fine, and the fix seemed to be an improvement. So far so good. The second game used the same rules. However, this one didn't go so well. I chose the Military strategy, and I crushed Chief underfoot. The Military strategy in Vacuum is a strange one. It's not overly strong in itself, but the Military strategy allows you to capture locations: either neutral ones or one from other players. It's the only strategy that allows you to steal points from other players: all the other strategies are purely cumulative - your points can only increase. The only defence against a strong military is a strong military (in the basic game, and some advanced ones), so if someone's feeling imperious you need to step up and defend yourself. There are a couple of advanced decks that give you alternatives to defending yourself, but of course there's no guarantee you'll be playing with them. If you choose not to defend yourself then a win is still possible, but there's pretty much only one way to do it. In the current version, there are five strategies, of which only three will score during any one game: Military, Exploration, Population, Trade and Knowledge. To win the game, you really need to score well in two of the chosen ones. Exploration rewards you for exploring interesting bits of the solar system, it doesn't require you to have any locations at all. 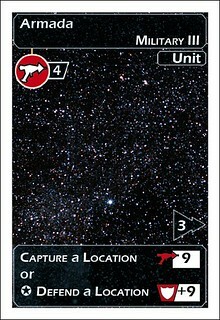 Population rewards you for having a large population spread across your locations, and in the current game, unless a particular advanced deck is in play, each location can only support limited population, so you need several locations to score well in it. Trade rewards you for earning lots of money by trading between pairs of locations. You get more money if you control the locations that are trading, so you need some locations to score well in it. Knowledge rewards you for developing advanced technologies, it doesn't require any locations to score well. So if you don't want to go military at all, your only choice (assuming that the Nationalism and Cold War decks aren't in play which allow you to defend yourself against a strong military without a strong military of your own) is to go Exploration and Knowledge. Don't get me wrong, I like that the Military strategy is important, being able to defend your territory fits the theme of a space race between competing empires nicely. But I don't want the game to be one where you either do Military or Exploration/Knowledge. So I've spent the second half of the week thinking of ways to break the dependence of the Population and Trade strategies on controlling lots of locations, so you have more strategies available to you. Population is going to be trickier, but I've an idea in my head for the Trade strategy. Of course, it'll change the game quite a lot, add more components and make it less of a deck-building game. Once I've got it sorted out in my head, I'll need to work out which advanced decks need to change as a result, knock up another prototype and give it a try. It's exciting that the game is still changing so much, but it means I'm further than I hoped from it being 'ready'. In other news, I managed to get along to Newcastle Gamers again for only the fifth time since I moved back here nearly two years ago. I didn't take Vacuum because of the concerns mentioned above, I just turned up at 8 and started looking for a game. A guy called Dan was loitering, waiting for another table to finish, so I joined him and a guy called Michael in playtesting Michael's restaurant-themed game. Dan also had a prototype he wanted to test later, though sadly I had to head off to bed before they started that. It felt a bit weird to be playtesting a game I hadn't designed - it was the first time I'd done it since the "heyday" of Reiver Games, and for once I wasn't trying to make a decision as a publisher about whether or not to take it further - just giving the designer a chance to try it out and hopefully providing some useful feedback at the end. It was the first time I'd met either Dan or Michael, and it wasn't until halfway through the game that the subject of my history designing and publishing games came up. Dan had heard of Carpe Astra and Sumeria and owned the It's Alive! iPhone app. He called me a 'veteran'! It was good to hang out with some other designers, Dan was talking about trying to set up a Newcastle spin off of Rob Harris' Playtest UK network of UK game designers. Sounds very interesting, and it would be great to try Vacuum in front of some more people. I'd definitely be up for that (especially if it's in a pub! ).